Day two of the GSL7 tour started with a long bus ride from Fresno to Las Vegas. We drove through the largest windmill field in California, stopped at an outlet mall to shop and have lunch, got a look at the Mojave Desert, and crossed the state border into Nevada. Once we reached Vegas, it was nearly 5:00pm, but there were plenty of people out and the weather was still very warm. After dropping off our belongings at our Las Vegas Hotel, The Excalibur, some of our group enjoyed free time in Vegas, while the rest of us went on a city tour and to see a famous Las Vegas Show at Bally’s. The first stop we made on our mini Vegas tour was to Ceasar’s Palace to view the inside and to watch the free show, which was short, but entertaining. 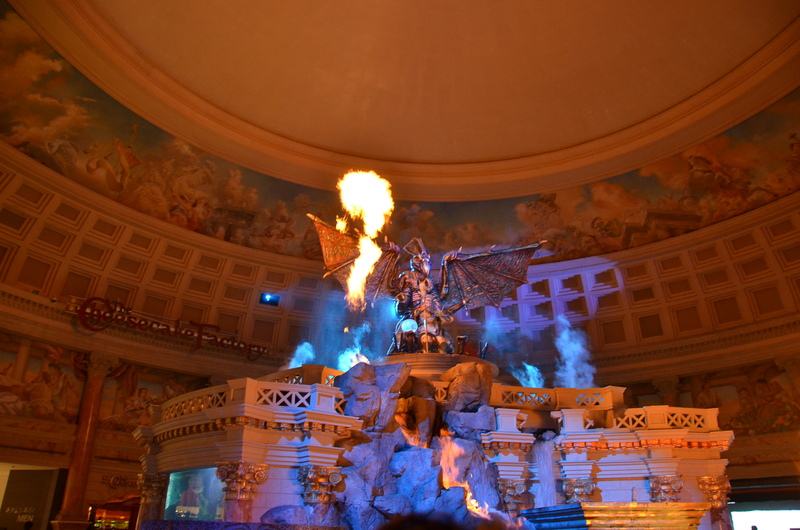 The show’s animatronic characters told the story of the fall of Atlantis and took place at the fountain inside the hotel’s mall. There was also a large aquarium, restaurants, and various stores to enjoy inside! After that, we headed to the Venetian, another famous Las Vegas hotel. The Venetian is well known for it’s awesome man-made sky and Venice theme. There is even a river running through it with gondolas! While we were here, we watched another free show that incorporated singers, actors, and jugglers in costume. By that time, it the show at Bally’s was soon to start. Those of us that signed up to watch made our way to Bally’s Hotel and Casino. Luckily, our tour guide had taken care of arranging our tickets for us beforehand, and it was easy to get inside and find our seats in time for the show. The show we watched was called Jubilee!, a traditional Vegas show with plenty of singing dancing,and fantastic costumes and set changes. Jubilee! gives you a real taste of Las Vegas, with over 1000 costumes, and close to 100 performers including acrobats, Vegas showgirls, vocalists, and dancers. If you haven’t seen a show like this, you haven’t truly experienced Las Vegas. Keep in mind that the Jubilee! show is for guests over 18 years of age. Following the show, we met up with the rest of the group to finish our city tour. The bus took us to the Bellagio hotel where we were able to witness the beautiful fountain show and music. We finished our tour with a visit inside the Bellagio to see the famous flower arrangements in the Conservatory and Botanical Gardens. 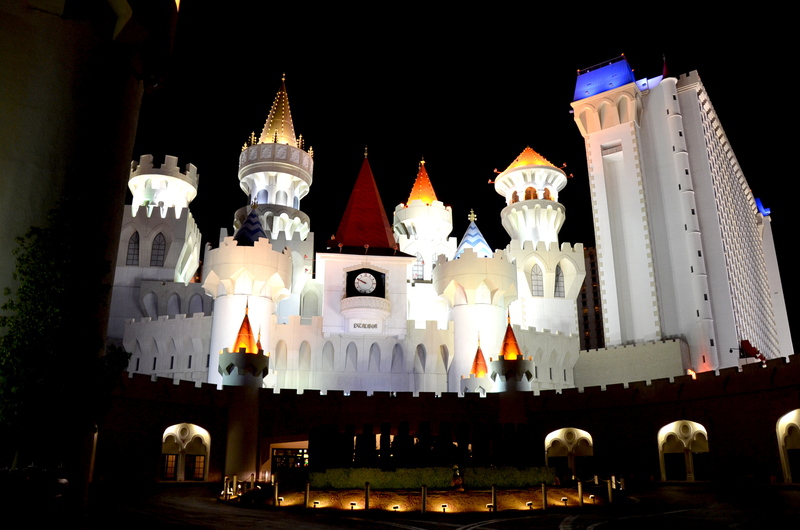 On our way back to the Excalibur, we drove down Las Vegas Boulevard and our guide pointed out many other sites that we might be interested in visiting on our own time. The next day, we would have an early start to go to the Grand Canyon, and then we would spend one more night in Vegas! What’s your favorite Las Vegas attraction? This entry was tagged Bellagio, Caesars Palace, Las Vegas, travel, Vegas. Bookmark the permalink.